With grit, poetry, and humor, Peter Heller, acclaimed author of The Whale Warriors, recounts his remarkable journey of discovery-of surfing, an entirely new challenge; of the ocean's beauty and power; of the strange surf subculture; of love; and, most of all, of how to seek adventure while crafting a meaningful life. Having resolved to master a big-hollow wave-that is, to go from kook (surfese for beginner) to shredder-in a single year, Heller travels from Southern California down the coast of Mexico in the company of his girlfriend and the eccentric surfers they meet. Exuberant and fearless, Heller explores the technique and science of surfing the secrets of its culture, and the environmental ravages to the stunning coastline he visits. As Heller plumbs the working of his own heart and finds joy in both love and surfing, he affords listeners vivid insight into this fascinating world, with all of its perils and pleasures, its absurdity and wonder. 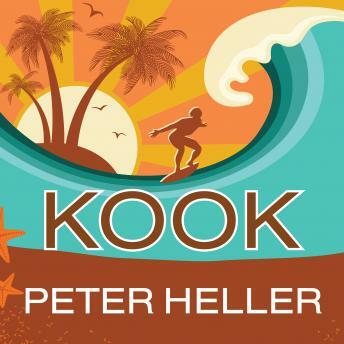 Exhilarating, entertaining, and moving, Kook is a love story between a man and his surfboard, a man and his girlfriend, a not-so-old man and the sea.